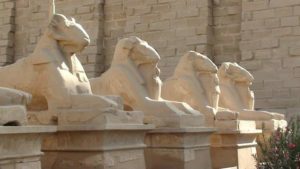 Today, you will explore the largest two temples in the city of Luxor, which were dedicated to the Theban Triad, Amun, Mut, and Khonsu, the impressive temple of Karnak, and the majestic temple of Luxor. The “Karnak” is the Arabic for “the fort” or “the protected area” but the complex was known as ” pr _ Imn” or” the house of Amon” for the ancient Egyptians, after that the name was changed by the Greeks to “ipt _ swt” or “the northern thrones”. The complex was dedicated to the god Imn ” the hidden “, who was just a little, unknown local deity. When Luxor became the capital of Egypt, the god’s importance was increased. He then became like a national god. He was the creator, the sustainer and the lord of the gods. His consort was the goddess Mut. The couple adopted the god “Khonsu” the moon god. The complex was begun in 2000 BC, and expanded through 1700 years, and is considered not completed. In the 1st open court is the chapel of the Nubian king Tahraqa. To the right of the open court, is the small temple of Ramses III. The obelisks of Tuthmosis and Hatshepsut stand like two needles among the structures of the complex. This temple is situated in the downtown of Luxor. It bears the name of the city al-Luxor or “the palaces”. It is very small to karnak but is completed. This temple was dedicated to the consort of Amon, the goddess Mut, so it was the place of the harem of Amon. 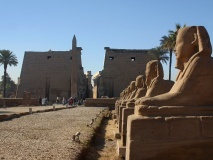 The two temples Karnak and luxor are linked by the sphinx avenue. 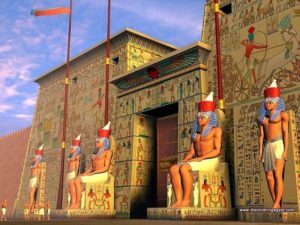 The 1st pylon was built by Ramses II, and is decorated with the scenes of his famous battle of Kadesh against the Hittites. This pylon is fronted by 6 statues of Ramses and 2 obelisks. Just 3 statues and one obelisk still there. The mosque of Abu el Hagag is situated in the 1st open court of the temple. A colonnade with its 14 columns, was built by Amenhotep III, takes you to the 2nd open court. Some Coptic ( Christian ) scenes are found in what is so-called “the church”. In the rear part of the temple is the shrine of Alexander the Great and the birth room of Amenhotep III. It is a great temple commemorates to all the periods of the Egyptian history.